We first opened our doors August 21, 1998 and have been serving the local community ever since. We are full service shop and aim to serve and take care of the needs of cyclists at all levels. 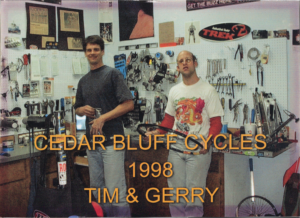 Owners and business partners Tim and Gerry were born in Knoxville and grew up in the neighborhood behind the shop. They raced BMX in the 1970’s and have been active in the local bike scene since the 1980’s. Interested in joining the CBC team? Fill out an application.